Today is the 145th Anniversary of Hermon MacNeil’s birth. The above celebrates his life from the Everett, Massachusetts city website. MacNeil's 12' 8" statue Washington (left ) from the other side of the Arch. 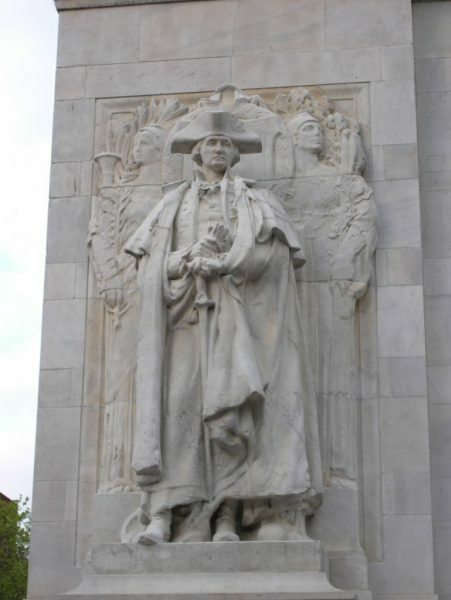 Pictured below is Hermon A. MacNeil’s sculpture of General Washington in the uniform of the General in Chief of the Continental Army placed on the easterly pedestal base of the memorial Arch on May 27, 1916. H. A. MacNeil's "Washington at War" balances the east side of the Arch in Washington Square while Alexander Stirling Calder's "Washington as President" graces the west side. Both sculptors studied at the Ecole des Beaux-Arts in Paris and represent that art style. The first Washington Arch was constructed to commemorate the centenary of George Washington’s inauguration as the first President of the United States. That Memorial Arch was a temporary structure meant only for the celebration in 1889. Stanford White, of the architectural firm of McKim, Mead and White, (click name to see their work) was one of the first to be associated with the City Beautiful and the Beaux Arts movements dedicated to cleaning up American cities and planning them with order and artistic beauty. The Arch stands at the end of Waverly Place and Fifth Avenue. The neighborhood was lined with mansions of the wealthy in the gilded age before World War I. At the University of Illinois, Abraham Lincoln has been released from the vault. He is out for public view. No, this is not a student prank (like the 1979 Illini Incident) when the MacNeil’s Lincoln Statue disappeared. This time its actually a year-long Lincoln party. Starting at noon on Sunday February 20th, the refurbished Lincoln bust by Hermon A. MacNeil will be on public exhibit in the Spurlock Museum at U of I.
MacNeil’s Lincoln has graced the Lincoln Hall stair case since 1928. It was removed for safekeeping in a vault when construction began on a total restoration of Lincoln Hall. The empty niche that the statue normally occupies is visible in this video of the Lincoln Hall Kick Off Ceremony (the miniature bust of Lincoln seen here is NOT one of the MacNeil sculpture, but of another artist.) For the next year it will be in Spurlock for viewing in a 360 degree venue, unlike the setting shown above before restoration. The Public can celebrate MacNeil’s Lincoln Statue at the Spurlock all year. Mr. MacNeil’s statue is dear to many generations of Illini. We are working on a video for our “This Old Hall” series on the restoration of Lincoln Hall. (Holly, I hope the video has a 360 scene of the statue as it appears on display in Spurlock ~ webmaster). Do you know how Mr. MacNeil felt about our statue? Gutzon Borglum's famous Lincoln also has a shiny nose from public petting of the piece in Springfield, Illinois. “SCULPTURE SHOULD BE THE MOST EXCEPTIONAL OF THE ARTS. IT SHOULD EXTERNALIZE ONLY THE RAREST AND THE MOST ABSOLUTELY BEAUTIFUL MOMENTS OF LIFE, CHOOSING WITH IRREPROACHABLE DISCRIMINATION FROM THE FORMS, THE JOYS AND THE SORROWS OF HUMANITY. A SCULPTED MOMENT WHICH IS NOT ADMIRABLE IS A PERMANENT CRIME, A PERSISTENT AND INEXCUSABLE OBSESSION.” Lorado Taft, Modern Tendencies in Sculpture, University of Chicago Press: Chicago, 1921. p. 9. “his good taste united with a fine decorative sense and with much fluency of handling”… Running through all these works is a dependable sanity most gratifying to meet amid the eccentricities and vagaries of current endeavor. The sculptor has never exemplified this quality to better advantage than in his fine “Lincoln” model, a work meriting enlargement and a prominent place.” Lorado Taft, Modern Tendencies in Sculpture, University of Chicago Press: Chicago, 1921. p. 120. How did MacNeil feel about his Lincoln statue? I can’t answer that directly, but MacNeil expressed his thoughts and feelings about the sculptor’s task in 1917. At the annual meeting of the American Federation of Arts, MacNeil spoke of the progress of contemporary sculpture. Errant Bronzes: George Grey Barnard’s Statues of Abraham Lincoln (American Arts Series/University of Delaware Press Books) by Frederick C. Moffatt (2000), p. 129. He went on to suggest that this radiated art spirit, had to be discovered in the hearts of the observers of the piece. I know myself, from reading other accounts of MacNeil describing his Marquette, Jolliet, Illini grouping in Douglas Park Chicago, and his Ezra Cornell statue at Ithica, New York, that this art spirit radiated in MacNeil himself as he planned, prepared and sculpted these works. His heart went into and radiated from each of his sculptures and memorials. Studying the details he put in them, reveals that to me. Now the public can assess that at the Spurlock. SO, Enjoy, Celebrate, and MacNeil’s Lincoln, The Lawyer. May you anticipate the 2013 re-dedication of Lincoln Hall as your 21st Century tribute to Mr. Lincoln. Happy Birthday Mr. Washington! ~ Part TWO ~ MacNeil Month #6 ~ The President Who would NOT be King. NOTE: February 22nd marks the 279th Birthday of George Washington. February 27th is the 145th Birthday of Hermon A. MacNeil. well as the expectations of the people were put upon him. 1) As a large man with great physical bearing, he was an embodiment of authority all his life. 2) At 6′ 4″ and slightly over 200 lbs, he was a full head taller contemporaries. 3) Washington was not a handsome man but when he set in motion, his full package conveyed a sheer majesty. Benjamin Rush observed, “He has so much martial dignity in his deportment that there is not a king in Europe but would look like a valet de chambre by his side. 4) As a fledgling nation that had only known “ROYALTY” prior to independence. So any leader who looked royal was eligible, so to speak, for coronation. 6) It did not help that he often portrayed a royal style of dress, designed his own uniforms and had them tailor-made to fit his striking frame. Arch, on Fifth Avenue, New York. manner, to fit each other and the Arch itself." this month) as he closed his comments over the grave sites at Gettysburg. The statue and plinth dwarf the man below. in the third year of the Presidency of John Adams. Yes, "we have a republic, if we can keep it." Calder remind us of that heritage. For Mr. Washington was:   "A Man Who Refused to BE KING!" The Arch when traffic was still allowed in the Square. Joseph J. Ellis, Founding Brothers, Knopf: NY, 2001. p. 120-161 (especially 124-127). TITLE: "A Republic if you can keep it." Happy Birthday Mr. Washington! ~ PART ONE ~ MacNeil Month #5 ~ The President Who would NOT be King. February 22nd marks the 279th Birthday of George Washington. The Arch in Washington Square Park, NYC, contains TWO separate sculptures of Mr. Washington. The presence of two distinct representations of this remarkable American rather than ONE, is remarkable. So, why TWO statues? Well, the first statue created by Hermon A. MacNeil represented General Washington, as the soldier, the Commander of the Continental Army of the American Revolution. The second created by Stirling Calder portrayed Mr. Washington as the statesman, the President. BOTH sculptures are necessary to portray George Washington’s TWO essential roles in the creation and establishment of the American republic. Having now finished the work assigned me, I retire from the great theatre of Action—and bidding an Affectionate farewell to this August body under whose orders I have so long acted, I here offer my Commission, and take my leave of all the employments of public life. "The Man Who Refused to Be King!"